Funnyman Jack Black for years was a supporting actor who appeared in films like Waterworld, Bob Roberts, Enemy of the State, I Still Know What You Did Last Summer and Demolition Man with bit cameos, but things have changed and he is now a major contender at the Box Office. 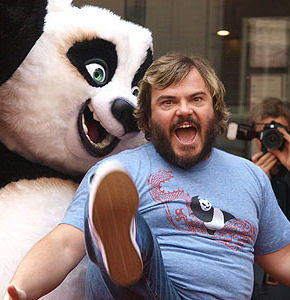 THR is reporting that Jack Black will be reuniting with "Kung Fu Panda" writers Jonathan Aibel and Glenn Berger for a new live-action untitled comedy. The film centers around an American (Black) who wakes up on the beaches of Cuba with no idea of who he is or why he is there. He comes to the believe that he is a superspy, when in actuality he is the further thing from that.